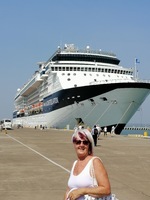 We chose this cruise because of where Connie was taking us, we hadn&apos;t been to Colombo, Cochin, Goa, Mumbai, Muscat or Abu Dhabi. (We had been to Phuket and Dubai several times before). After reading many reviews about Connie before, we really didn&apos;t know what to expect as there were so many conflicting reviews both good, bad and ugly. So I&apos;ve decided to write a review on our experience on aboard and Connie in general. Connie herself is in great shape, nice and clean and everything was working on board, with no smells. 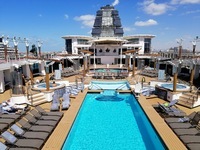 In regards to activities onboard there were many choose from, but we chose to relax and just take in the sun on sea days and venture out when docked at all the ports. In regards to Shore Excursions we did choose one from the ship, but it turned out terrible so we complained and received a 30% refund. To be fare to the Shore Excursion team it was the tour guide who was terrible not the places we visited. Cabin, WOW we had no idea that it was going to be that BIG, we had an Oceanview Category 4 Stateroom Number 8003 and our cabin attendant was absolutely superb. Dining was easy, we just rocked up and asked to sit with 6 other guests and within a couple of minutes we were seated and every night apart from 2 nights we sat with different guests and the food was great, we tried just about everything they had on the menus, with top service all around. Entertainment on board this cruise was really really good compared to some horror stories we heard, in fact all over the ship the entertainment was good. The Ports, well what can I say they were simply fabulous, Phuket jus simply laid back and just did what we wanted to do that included catching up with friends (using free Wifi of course), Colombo it was a pretty place and would like to go back again and spend more time, Cochin, well we kind of liked it but Goa and Mumbai were much much better and overall we thought India was kind of organised chaos. Muscat was a beautiful city where the mountains reach out and touched the sea and the city and harbour met. Aub Dhabi, did&apos;n really do any thing for us, it looked like another suburb of Abu Dhabi. 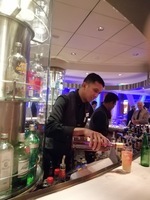 Now for the best part, on Connie there is this special place called the Martini Bar, we lived there every night of the cruise just meeting the most loverly people you could ever meet from all over the globe and the 4 bar tenders put on the best Martini/Cocktail shows I ever seen, pouring 15 Cocktails in one go, it was simply the best, well done lads. Overall we had a WOW of a time on Connie will be sailing on her again in the very near future. We chose this cruise because of where Connie was taking us, we hadn&apos;t been to Colombo, Cochin, Goa, Mumbai, Muscat or Abu Dhabi. (We had been to Phuket and Dubai several times before). After reading many reviews about Connie before, we really didn&apos;t know what to expect as there were so many conflicting reviews both good, bad and ugly. So I&apos;ve decided to write a review on our experience on aboard and Connie in general. Connie herself is in great shape, nice and clean and everything was working on board, with no smells. 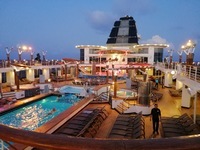 In regards to activities onboard there were many choose from, but we chose to relax and just take in the sun on sea days and venture out when docked at all the ports. In regards to Shore Excursions we did choose one from the ship, but it turned out terrible so we complained and received a 30% refund. To be fare to the Shore Excursion team it was the tour guide who was terrible not the places we visited. Cabin, WOW we had no idea that it was going to be that BIG, we had an Oceanview Category 4 Stateroom Number 8003 and our cabin attendant was absolutely superb. Dining was easy, we just rocked up and asked to sit with 6 other guests and within a couple of minutes we were seated and every night apart from 2 nights we sat with different guests and the food was great, we tried just about everything they had on the menus, with top service all around. Entertainment on board this cruise was really really good compared to some horror stories we heard, in fact all over the ship the entertainment was good. The Ports, well what can I say they were simply fabulous, Phuket jus simply laid back and just did what we wanted to do that included catching up with friends (using free Wifi of course), Colombo it was a pretty place and would like to go back again and spend more time, Cochin, well we kind of liked it but Goa and Mumbai were much much better and overall we thought India was kind of organised chaos. Muscat was a beautiful city where the mountains reach out and touched the sea and the city and harbour met. Aub Dhabi, did&apos;n really do any thing for us, it looked like another suburb of Abu Dhabi. Now for the best part, on Connie there is this special place called the Martini Bar, we lived there every night of the cruise just meeting the most loverly people you could ever meet from all over the globe and the 4 bar tenders put on the best Martini/Cocktail shows I ever seen, pouring 15 Cocktails in one go, it was simply the best, well done lads. Overall we had a WOW of a time on Connie will be sailing on her again in the very near future. What can I say about our Cabin, but WOW we had no idea that it was going to be that BIG, we had an Oceanview Category 4 Stateroom Number 8003 and our cabin attendant was absolutely superb. The Cabin was huge and even the show could fit two! We had a table and chair, plus a 2 seater sofa with heaps of cupboard space.